Enveloped, spherical, about 120 nm in diameter. The RNA genome is associated with the N protein to form the nucleocapsid. Monopartite, linear ssRNA(+) genome of 26-26.5 kb in size. Capped, and polyadenylated. The leader RNA at the 5' end of the genome is also present at the end of each subgenomic RNAs. 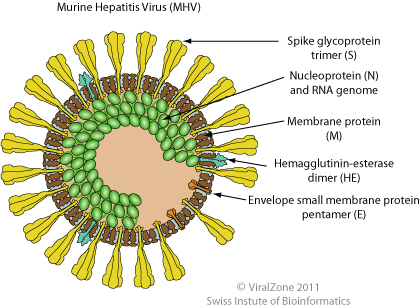 Attachment of the viral S protein to host receptors mediates endocytosis of the virus into the host cell. NATURAL HOSTS Mammalians and birds.